The above SVG image was generated by computer using Python and Pycairo. View the SVG image full-size. General histories listed on the page for Books about Angus & Kincardineshire, in particular Warden, vol. 3, pp. 304-347. 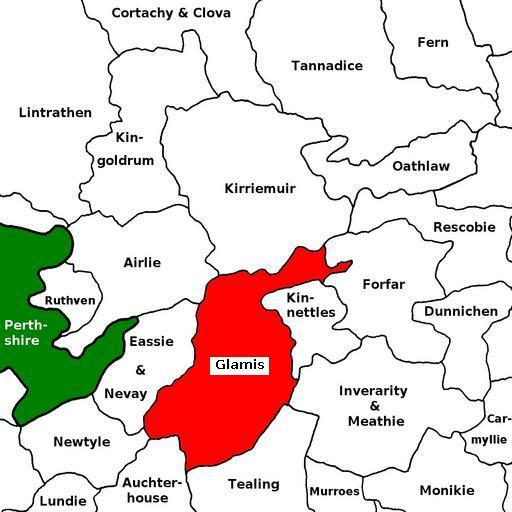 For the full range of maps of Glamis, see National Library's Maps. 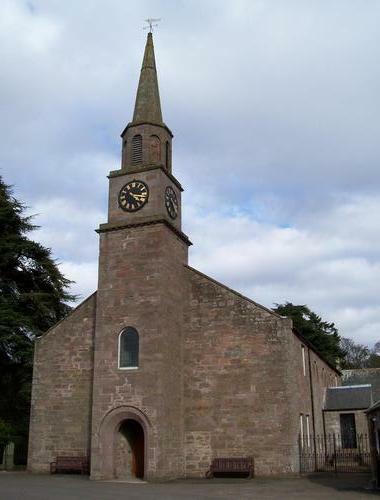 See Geograph.org: Glamis - recent photographs of Glamis. National Grid ref. NO3846. Located at National Grid ref. NO386468. Built 1792. 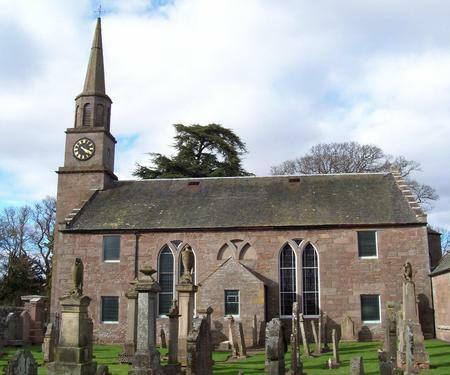 The mediaeval kirk, dedicated to St Fergus, was one of those that belonged to Arbroath Abbey. Above: the burial vault of the earls of Strathmore and Kinghorne in Glamis kirkyard; it was the south transept of the former kirk, believed to have been built in the 15th century. 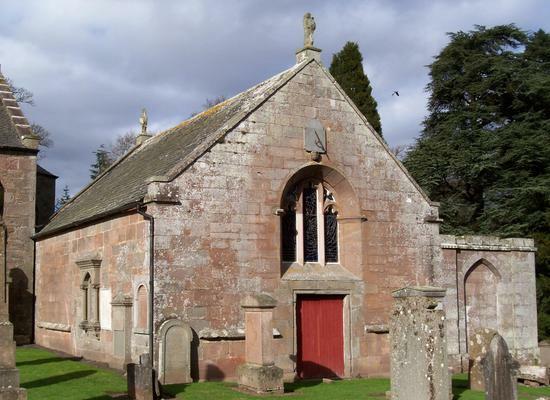 See RCAHMS site record for St Fergus's Church, Glamis. David Brown 1601-1625 min. of Nevay 1590, also having Eassie, Glamis and Lintrathen in the charge 1593, but Eassie alone in 1596; removed to Eassie 1597x1599; pres. on dem. of Robert Ramsay, tr. & adm. 1601; also held parsonage & vicarage of Clova, which he dem. bef. 1 Mar 1616; d. Mar 1625, an old man; mar. ; issue: James, M.A. ; Cath. ; Geo. John Balvaird primus 1685-1698 M.A. St Andrews 1642; ord. to Kirkden 13 Jun 1650; tr. & adm. 24 Sep 1685; d. 1 Mar 1698, aged ca. 76; mar. Eliz. Spalding; issue: John, min. here; Wm, min. of Kirkden; Alexr; David, servitor to earl of Strathmore; Robt; Marjory (mar. Robert Strachan, min. of Colvend); Margaret (mar. James Walker, min. of Buittle); Eliz. ; Kath. Andrew Jervise recorded some monuments at Glamis in his Epitaphs & Inscriptions, vol. 1, pp. 180-6 and Charles Rogers also recorded several verses on stones there in his Monuments & Monumental Inscriptions in Scotland, vol. 2, pp. 231-5. Capt. The Hon. Fergus Lyon - B.W. Capt. D. Maxwell, M.C. with bar - B.W. Lieut. Alex. McGregor - B.W. Sgt. Alex. Smart - B.W. L/Cpl. John M. Johnstone - B.W. Pte. Peter Crighton - B.W. Pte. David Fearn - B.W. Pte. Peter Gordon - B.W. Pte. Andrew Hill - B.W. Pte. James Kinnison - B.W. Pte. James Ritchie - B.W. Cpl. John Tosh - C.H. Spr. R. T. Johnston - R.E. Cpl. Alex. Scott - H.L.I. L/Cpl. Andrew Suttie - H.L.I. Pte. Jas R. Buchanan - H.L.I. Cpl. John R. Maxwell - F.&F. Yeoy. Cpl. Edward Taylor - R.S. Pte. David Fyffe - A.&S.H. Pte. Charles Leonard - E.Lancs. Pte. Charles Milne - G.H. Pte. Harry Small - S.H. Gunr. William C. Grant - R.G.A. Pte. F. Munro - Can. Fcs. Capt. The Hon. 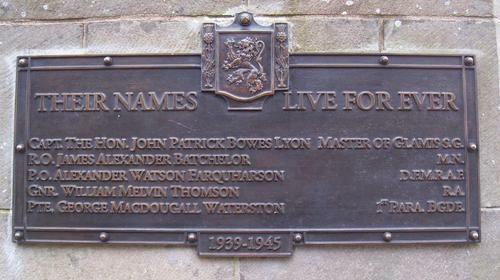 John Patrick Bowes Lyon, Master of Glamis - S.G.
R.O. James Alexander Batchelor, M.N. P.O. Alexander Watson Farquharson, D.F.M. - R.A.F. Gnr. 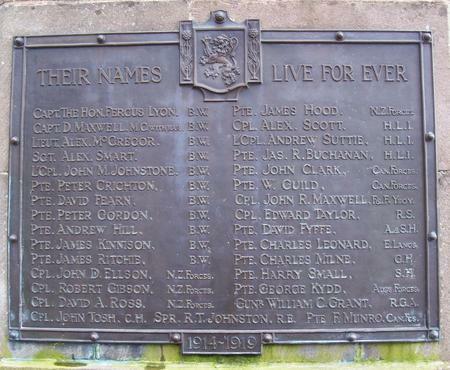 William Melvin Thomson - R.A.
Pte. George Macdougall Waterston - 1st Para. Bgde. Glamis was in the Commissariot of St Andrews.